We in the real estate industry face a mountain of technology and an avalanche of information. We shovel through bigger data and faster technology in the hope of wowing our potential customers, but I believe the thing that raises real estate professionals above the technology and information is not our ability to package up this data and present it in bite-sized pieces but rather our ability to relate to people. 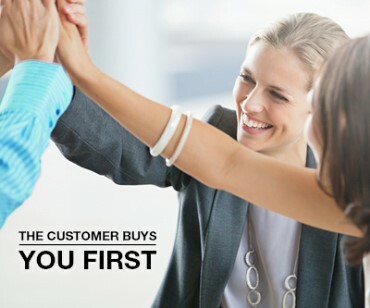 The customer buys you first and then buys what you’re going to do for them and how you’re going to do it. Wise people from Theodore Roosevelt to John Maxwell have been credited with saying, “People don't care how much you know until they know how much you care.” Your customers want to build a relationship with you and one of the best ways you can set yourself apart and cement them in is to humanize your business. Before you go to a listing presentation, you do exhaustive research on the property. You pull information on comparable listings, you research the neighbourhood, title and tax records and so on. But what if you did your homework on the home owners in the same way? What if you knew, going into the appointment, that their daughter had just graduated from University or that they had suffered a loss? This information is just as useful as any you could know about the property itself. Google your customers, friend them on Facebook and connect with them on LinkedIn to gain a perspective on their personal and business lives. Don’t rely on Facebook’s algorithms to deliver their posts to your newsfeed; add them to a list. Pick up the phone to congratulate them on the graduation or offer sympathy for their loss. - Create a Google alert for your customer and their company so you can be aware of any changes. For example, I’m dealing with someone now whose company recently issued hundreds of layoffs. Wouldn’t you agree that piece of information is useful to know going into a conversation with him? Charlie is an app which searches the internet for information about your customer which you may be able to use to expand your business relationship. For example, I have a meeting today and I used Charlie to find out more about the person with whom I will be meeting. I discovered that he is self-employed and his business celebrated its 15th anniversary yesterday. I read how proud he was of its humble beginnings and how much they’ve grown. His personal pride in that accomplishment was evident. This knowledge presented a great opportunity for me to relate. Crystalknows.com is an app that utilizes DISC personality profiling to, according to their website, “generate personality insights for your contacts so you can write better emails, run better meetings, and improve your working relationships.” Understanding whether someone is predisposed to be dominant, inspiring, supportive or cautious can help you to tailor your conversations and the way in which you deliver information. - After a meeting, I often follow up by sending a personalized video email expressing my pleasure in meeting them, making note of something personal about the meeting and commenting on our plans for follow-up. - If you could wave a magic wand, describe your perfect world. - Paint the picture for me. - Tell me more about that. - What would you like to see happen? And then be quiet and listen. The more I ask those effective questions and the more I allow them to talk, the closer our relationship will develop, but equally important, the better I will be able to serve them. Real estate agents tend to forget they’re dealing with real people with real boxes and real moving vans. Your customers are uprooting their life. People move because of their circumstances; upsizing or downsizing, getting married or divorced, having children. You as their trusted advisor need to know, understand and empathize with those circumstances. Remember, do unto others the way they want it done is the Platinum Rule.